Today all professionals in dog breeding, training and handling are in dilemma regarding choosing dog accessories. 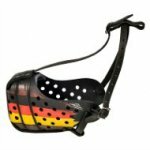 Many of them know several professional brands of dog sport accessories, but not all. Mostly only on championships one is able to look at the advertisement of dog accessories from sponsoring companies. We try to visit most of events, but not all during each year. 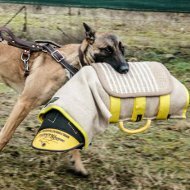 Our investigation is based on the products that are bought by customers engaged in professional training such as Schutzhund and Mondioring. 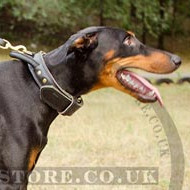 This is one more shopping site from world famous company Fordogtrainers in the United Kingdom. Usually UK trainers are eager to buy our products, because of their high quality and producer's prices. This model was developed by our specialists for large dogs. 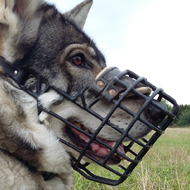 This stainless steel muzzle is a universal model. The advantage of this model is that it maximizes comfort for your dog. 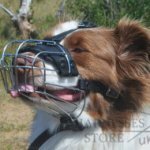 Comfort is an important factor for any dog owner, so the dog can open mouth, drink water and breathe freely with this muzzle. It is covered with rubber coating to prevent corrosion. The muzzle is suitable for summer and winter because rubber coating protects dog's nose from cold and prevents it from sticking to the wire. 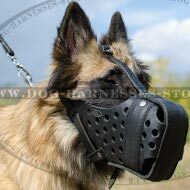 This leather muzzle is for strong and large dogs. 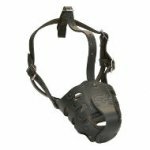 The muzzle is a working model for military, police and for fire dogs training. 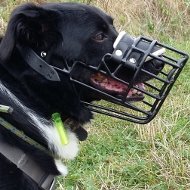 This muzzle prevents your dog from biting, but allows it to breathe freely. Inside leather coating there is small metal plate that keeps the shape of the muzzle. 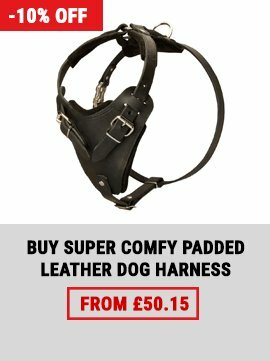 It is comfortable for work and training of your faithful friend and can be used at any time. 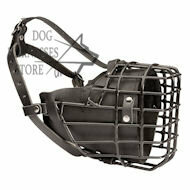 Thanks to its great design the muzzle is well ventilated. 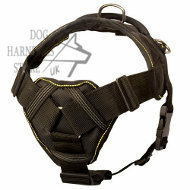 Agitation training and daily muzzle has high-quality, functional and original design. 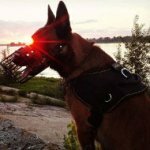 This special dog muzzle for military service is considered to be the best one for dogs, working in special units of the army, police and guard organizations. M58 muzzle is designed by our specialists together with cinologic units of military and police service. The result of this collaboration combines strength and reliability of design and maximum comfort for the dog. It is very durable and will serve for a long time, the dog can open its mouth freely. 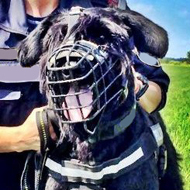 This muzzle is the undisputed leader of the line for working dogs and is used successfully in military units and police work. 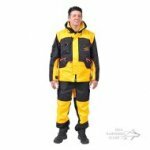 It is made of metal with a layer of special protective rubber coating, so it is very suitable for work in very cold temperatures. The muzzle won't press the animal's eye zone even with maximum loads. 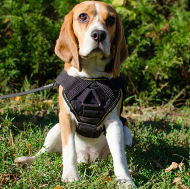 We produced this new model of multifunctional nylon harness for training, exercises and walks with the dog. It is super light-weighted and very comfortable. 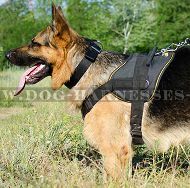 The harness is a real discovery for dogs with high skin sensibility. It is made of high-quality material. Thanks to top-quality strong plastic buckle it is easily to take off. 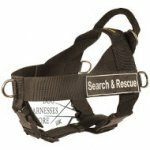 This harness is waterproof and can be used in wet conditions. It will help to control the dog and to correct its behavior! 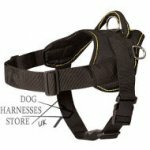 We guarantee that your pet will be very happy with this harness that combines design and functionality! 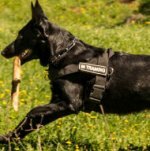 It is applied by many Schutzhund training professionals. Introducing the collar for large dogs it should be said that it is made of high-quality materials, leather is very strong, durable and soft, equipped with handle that helps to correct behavior of your pet. 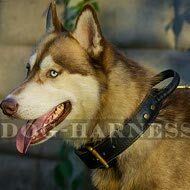 This collar is comfortable and durable. It is multifunctional, can be used as a street training activities collar, exercising dog collar, master training dog collar. 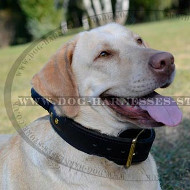 The collar is ideal for large dogs, giant dogs and service dogs. Our collars give comfort and freedom of movement without irritations of the dog's skin. 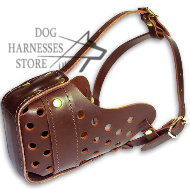 This adjustable, handmade and stitched leather leash is a great solution for experienced breeders and trainers. It is designed specially for sports. The main advantage is that you can adjust the length of the leash according to our need. This leash has two snap hooks of brass, two fixed and one floating rings, which make it comfortable and practical. Adjusting the snaps to the rings you may regulate the length and function of the leash. 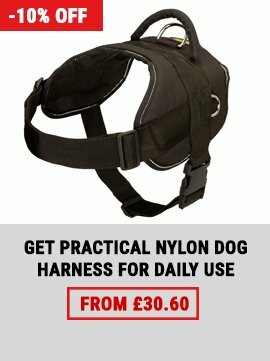 In the first case we get a classic leash, but if we adjust the floating ring we get a medium length leash, which is ideal for training your pet, and adjusting it to the third ring we will get a new length, at last, placing on our shoulder strap a hand will be free, our dog is always close and under control. The leash is suitable for dogs of different sizes and ages. It is multifunctional and can be used as a lead for walks, leash activities, leash exercises, leash teaching etc. 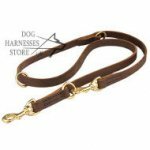 This universal leather leash has convenient snap hook that allows attaching or removing the collar ring quickly and easily. You can control and correct every movement of your dog with this leash. Perfectly oiled leather leash meets all international standards. It is multifunctional and can be used for dog training, tracking etc. This dog leash is perfect for large and strong canines. 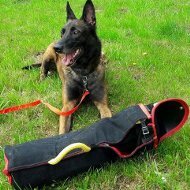 Introducing to your attention this sleeve for comfortable training of young and elder dogs it should be said that it is a universal tool in preparing canines for trials. The sleeve has adjustable bite area. The main advantages of this model are safety and comfort. The sleeve provides reliable protection of hand, arm and shoulder. It is also equipped with inner handle that allows you to maneuver and to control the process of training. Professional trainers advise using this gear for advanced training. All the advantages of this model can be tried by you on your own experience. 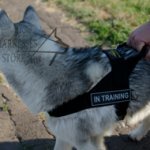 We propose a short model of dog bite training sleeve. It is made taking into account advice of professional trainers. The sleeve will help in preparing young and older dogs for championships. 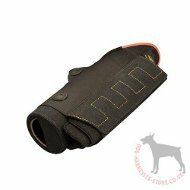 Special construction and high practicality are the major advantages of this dog bite training sleeve. Protects your arm to shoulder. It has a handle to facilitate the work with the sleeve. The sleeve is used for dog bite skills improvement. 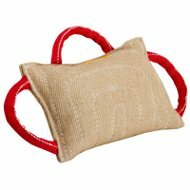 This jute bite pillow with 3 very comfortable handles is intended for young dogs. It is designed to develop dog bite skills. The materials are of the highest quality. This bite pad is safe, strong and durable. It resists strong bites. Handles help you to control training process. You will have a great pleasure during dog training. 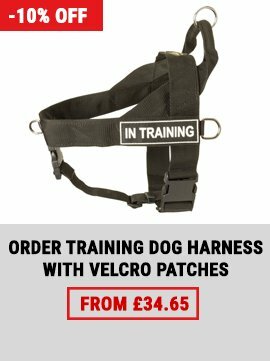 All these required TOP training accessories are sold directly in our Trainers' shop. 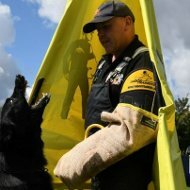 We wish you great success in training and championships with your dogs! 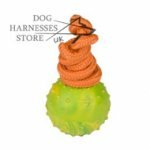 Apply to us by E-Mail info@dog-harnesses-store.co.uk or contact us on Facebook. We are always open to assist you in choosing the best professional gear for your dog. See also TOP 10 accessories for dog owners.